The obvious and numerous round holes that on the blade of this unique species make it easily identifiable in the field. However, these holes are often absent or less numerous in younger blades. The blade is undivided, bold red in colour, and tapers abruptly to a slender stipe that connects to a disc-shaped holdfast. As the seaweed ages, the colour tends to bleach to pale yellow, particularly at the upper margin. 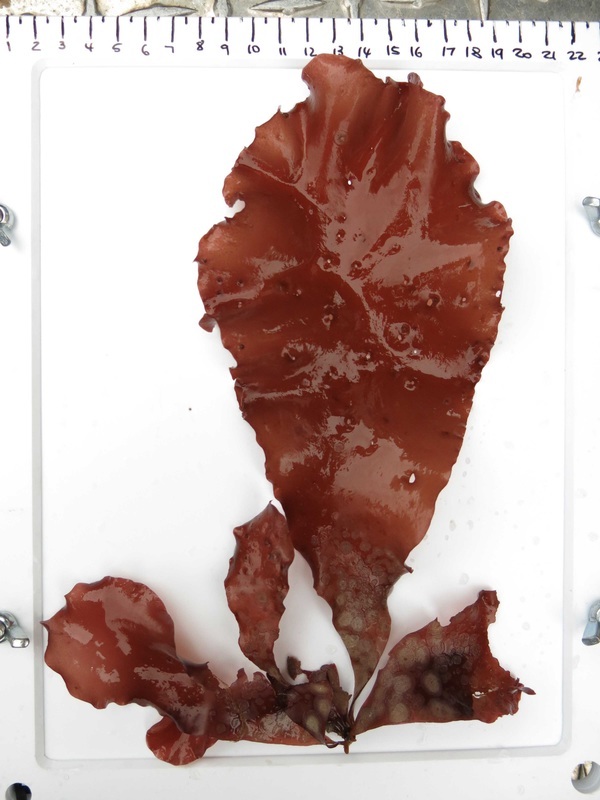 Growing up to about 60 cm in length, and 20 cm in width, this is one of the largest species of red algae on BC's Central Coast. As blades become reproductive, they become covered in numerous small, dark bumps (cystocarps). Younger blades of this species, when lacking holes, may resemble Palmaria mollis. However, the blade of P. mollis is lobed, while this species is unlobed. This species is common on rocky semi-exposed and exposed shorelines from the low intertidal zone to depths of 18 m. It becomes less common as shorelines become more sheltered. Its range extends from Korea, Japan, and Alaska south to Oregon. It is also found in Greenland and Spitzbergen, Norway. O'Clair, R. and Lindstrom, S. Sparlingia pertusa (Postels et Ruprecht) G.W. Saunders, Strachen et Kraft. In Klinkenberg, Brian. (Ed.). E-Flora BC: Electronic Atlas of the Plants of British Columbia. Lab for Advanced Spatial Analysis, Department of Geography, University of British Columbia, Vancouver. Accessed 2015-11-06.